Funny, sad, and thought-provoking … an African-American ornithologist’s video tips for birding while black. (Even more thought-provoking is the original article from which it sprang.) Props on the sweet Barred Owl call, too. “I just flew nonstop from Canada to South America and boy, are my arms tired.” No, you didn’t. 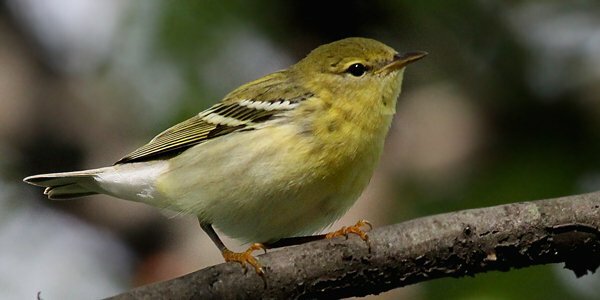 But the fall-migrating Blackpoll Warbler (as photographed above by Corey) apparently does. Writer and celeb birder Jonathan Franzen certainly knows how to ruffle feathers, with a controversial piece on the dubious merits for birdlife (in his view) of fighting climate change. The feather underground? Pigeons make themselves surprisingly comfy way down below in Frankfurt, Germany’s railway system. Only you can help prevent three threatened Australian birds from permanently falling victim to sugar gliders, according to a crowdfunding campaign. Severe weather can stress birds and even influence the coloration of their feathers, new research finds. Seattle doesn’t root just for the Seahawks … study reports that Emerald City residents (and those of Berlin, Germany) find common birds like finches and corvids worth opening their wallets for. Why did the chicken cross the archipelago? Scientists investigate the DNA of Hawaii’s free-roaming fowl. Have you ever seen two Hammerkop pretending to be bunk beds? Now you have. Indiana teacher raises the bar for newbie birders everywhere by finding the state’s first record of a Black-tailed Godwit. Researchers have figured out where the thought-to-be-extinct Bryan’s Shearwater is roosting. Different, but the same? Research that’s sure to peeve anyone who’s struggled to list both a Common Redpoll and a Hoary Redpoll. What kind of miscreant kicks a Barn Owl in mid-flight? An infomercial king who’s probably going to jail. Cyprus count yields a rarity: an almost all-black flamingo. Someone better tell that flamingo not to stay put and avoid Malta, where voters narrowly rejected a ban on hunting migratory birds. It’s not quite Tippi Hedren–worthy, but birds swarming your living room is probably fair game for some NSFW language. And last but not least, get your owl snark on.